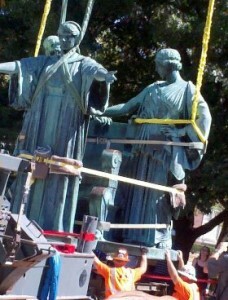 On August 7, the beloved Alma Mater Statue, an icon of the University of Illinois campus since 1929, was removed for restoration. The 13-foot bronze sculpture, which sits at the corner of Wright and Green streets, has gone decades without proper care, and is overdue for some serious R&R. Conservation Sculpture and Objects Studio Inc. of Forest Park, IL, just outside of Chicago, is taking on the project at a cost of nearly $100,000. 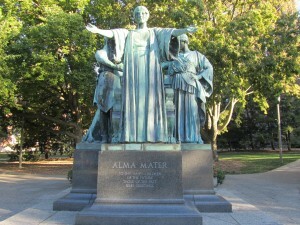 Created by University of Illinois graduate Lorado Taft, the statue represents the motto of ‘Learning and Labor’, represented by the two figures clasping hands behind the robed figure with outstretched arms, welcoming students with the inscription “To thy happy children of the future those of the past send greetings”. Read more about the project at The News Gazette and follow U of I on Facebook for updates.